All my friends and blog followers know that Hubby and I decided to take the plunge and purchase a used camper from friends. They had several years of enjoyment out of it and now it is our turn. 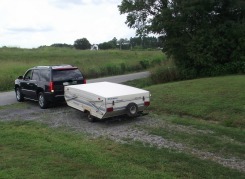 The Palomino Colt is a small pop up camper that should be easily pulled by my P.T. Cruiser. With it, we can now hit the open road without looking back. There are more amenities in the camper than I realized. It has an awning, kitchen table, sink and stove. There are also hook-ups for water and electricity. Theoretically it sleeps six. We'll know more when we try it out. Our daughters are currently in the process of planning lots of adventures. Most of these focus around state and national parks and all feature the Palomino Colt. We are looking forward to these trips and to going back to Alaska one day. The pop-up camper will also be useful for short trips of just a few days. I can even see us using it to visit our older daughter who is at graduate school. Since we don't have a trailer hitch yet our friends brought the camper to us. We really appreciate that! They are wonderful people. Both of our daughters have asked permission to borrow it at some point. Neither has any firm plans at the moment but we know that can change quickly. One text message from a friend is all it will take. Then, our daughters and their friends will hit the road and make their own memories. I wonder how many memories a Palomino Colt can hold? It looks like we're about to find out.